The pipeline Sabal Trail wants to connect to, Williams Transco in Alabama, blew up in 2011, flaming a hundred feet up, heard more than 30 miles away, left a crater more than 50 feet wide, destroyed 65 acres of trees, fried five acres of soil into pottery, and launched a 43-foot pipe section as a missile that landed 190 feet away. The cause was never announced. There was no construction going on, so could it be corrosion? Do we want another pipeline like that? 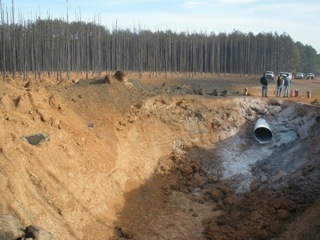 Williams did some pigging just before this pipeline rupture but they didn’t receive the pigging results until after the explosion. The word from the locals in Alabama is that Williams is now frantically digging up parts of this same pipeline in several different locations which could indicate the problem is not isolated.Williams does not have a good track record of pipeline safety. A Transco natural gas pipeline ruptured at approximately 3:07 p.m. Saturday with an explosion that could be heard for more than 30 miles while shooting flames nearly 100 feet in the air for over an hour…. The fire was isolated to a mostly unpopulated area down Highway 69 toward Myrtlewood — near Rembert Hills Road — on hunting land. There were no injuries reported but original reports indicated there were three hunters on the property at the time of the blaze. However, all were accounted for and left the property before the actual explosion. That’s in Marengo County, Alabama, near mile 90 on the map Transco included in its filing for the Hillabee Expansion Project to connect to the proposed Sabal Trail Transmission pipeline through Alabama, Georgia, and Florida. All three pipelines (those two plus Florida Southeast Connection (FSC) on southwards from Orlando filed to have a joint Environmental Assessment done by the same company the three pipeline companies selected. Robyn Knight, who lives in Jefferson, said she could see and hear evidence of the fire from her home. Transco said they would investigate the cause of the explosion. And there’s still no news of what caused it. 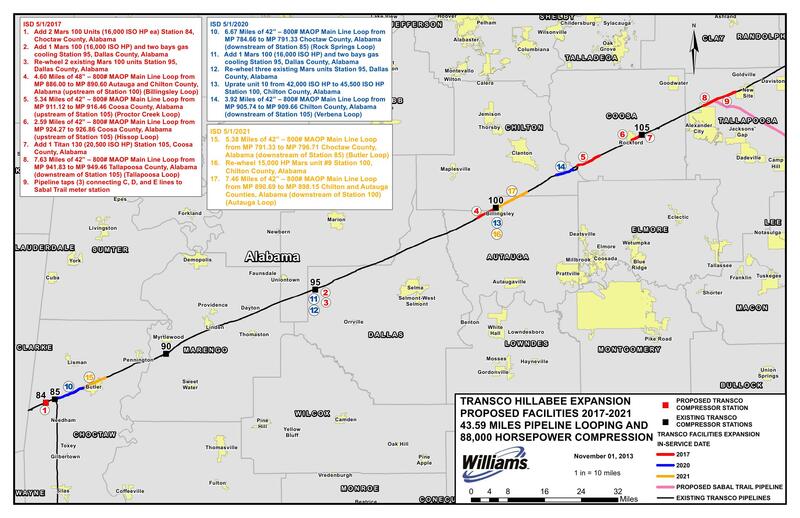 …to take necessary corrective action to protect the public, property, and the environment from potential hazards associated with a failure involving the Williams Transco Pipe Line (TPL) interstate natural gas pipeline system. That failure was “a large fireball and resulting in a 37-foot wide, 15-foot deep crater and a burn zone approximately 1125 feet in diameter” injured five people and caused 23 families to be evacuated near Appomattox, Virginia. That was only a 30-inch pipeline. The Notice alleged that Respondent violated 49 C.F.R. §193.2801 by failing to provide and maintain fire protection at its LNG facility at Carlstadt, New Jersey (Facility), …. The Notice alleged that Respondent violated 49 C.F.R. §193.2365(d) by failing to inspect each component protected from atmospheric corrosion at intervals not exceeding 3 years…. For both items, “Respondent did not contest this allegation of violation”. So PHMSA fined Transco. Here’s Larry Hjalmarson on a panel about Protecting Florida’s Energy Pipelines — Practices & Protocols. On that same panel: Danny Gibbs is director of Right of Way Acquisition and Environmental Construction Permitting for Spectra Energy Transmission in Houston. How about we deny Transco and Spectra and Sabal Trail and FSC any new pipelines? 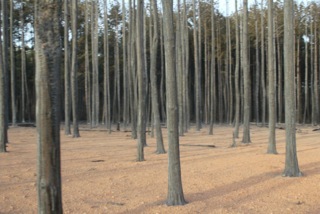 landscape, trees and wildlife ? been in place. Or worst yet failed????? it’s route from State to State. There has to be a better way for both parties. Per your answers, this untimely occurrence is more than likely a result of improper scheduling of the pig run. The line should not have been put back in service until the data had been analyzed. However, had a hydrostatic test been completed in the place, or in addition to, the pigging; this issue would more than likely have been found. Just goes to show how much technology has NOT surpassed some of the “good, old fashion” roots that pipeline operators have used for decades. It is purely an inexplicable practice to do a survey of the pipe walls vs. actually applying a pressure-stress test to the pipe. The ONLY explanation I could give for doing the smart tool not in place of but in addition to a hydrostatic test is the cost efficiency and for additional data. In conclusion, this is one more way that the text books and people that have no idea about where there natural gas and other items to make things such as: gasoline, diesel, kerosene, jet fuel, and many other things; come from. Having no additional pipelines/new pipelines would be like saying that 18-wheelers need to stay off of the road. You think standing in line at the grocery store is bad, just wait until YOU have to make a 12 hr.+ trip to go get groceries; or god forbid you’d have to actually plant something yourself and raise your own animals. Not to mention the fact that the beloved electronics that everyone invests their lives into these days. Good luck with all of that you guys. Yet it’s somehow everybody else’s fault. Uhuh. I do plant most of my own food (and sell quite a bit of it), and I have 15 KW of solar panels. Lots of other people will have solar power soon, too, regardless of delaying tactics by cash-in-before-the-carbon-bubble-pops fossil fuel companies and utilities, because solar prices keep going down while fracked methane prices have bottomed out. Then we’ll have more electricity without emissions, leaks, or explosions.